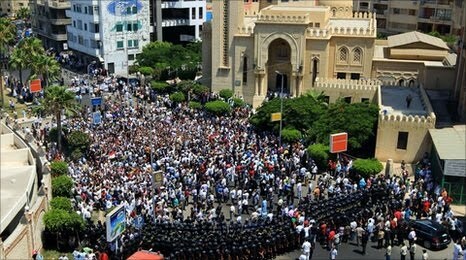 I am not sure if you guys are aware, but there's a pretty big series of events unfolding in Egypt. It certainly smacks of the word revolution. However, there are a lot that either haven't heard much at all or only a little about it. Sad, eh? That's the country we live in, folks. Where the halftime show for the Super Bowl - featuring what I called an embarrassment to Daft Punk fans everywhere - causes more of a controversy and sparks more debate than what an estimated 80 million people have to deal with on a daily basis. With a man we've supported, albeit in very private fashion, no less. Our tenuous support of Hosni Mubarak stems in large part from our dealings with Israel, so no doubt they're keeping a close eye on this, also. Well, regardless of what happens, this has become the biggest story in the world - and affected my travel plans. So hey, I'm providing much of a revolution of my own when it comes to fighting shady travel companies. Honestly? I'm pretty worried about the events unfolding. It has more of an impact on the world as a whole than I think people realize. It's more of a trickle down effect, though. That entire region is unstable. From Sudan - which recently saw South Sudan vote to secede - to Tunisia, Jordan, and Yemen. What we're witnessing is unprecedented in history. It could have long lasting ramifications with world relations. A revolution is what it truly is. I could honestly go on and on about what is happening, but this story has so many layers and complexities to it, that I simply don't have the room to discuss it. So enjoy your week, folks. And do try to pay attention to what's happening in your world! Freedom is the answer. Who's next?